Customize a tiny fairytale forest, desert landscape or any kind of botanical world in a jar for a cute + fun table decoration. Get inspired with these five projects! Plants add such a special and beautiful touch to a space, but sometimes maintaining houseplants can be a bit of a hassle, particularly with a busy schedule. But there's a simple solution! Creator of Miniscapes and self-confessed "lazy gardener" Clea Cregan lays out the ultimate guide to crafting your own terrarium in her new book. They're cheap to create, super easy to maintain, and make excellent and thoughtful gifts. We've pulled a few cute projects for you to try out to get a little dirty (but not too dirty!) 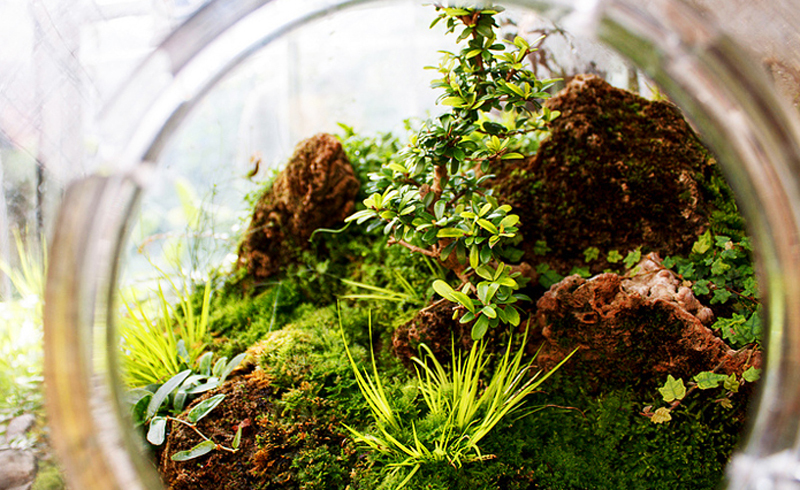 and introduce you to the world of terrarium-making. This project is super simple and looks great with one feature plant in the spotlight. You can add cute forest creature figurines to give at a whimsical atmosphere, like the tiny deer in this one. Step 1: Give the glass a good wash inside and out. Step 2: Pour the cream pebbles into the bottom of the vase, and gently shake to create an even layer. Add a separation layer, if using (this prevents the soil from dropping down into the drainage layer below. You can use brown paper, a fly screen, or weed matting. Trace around your container and cut out a shape that is 1/2 inch smaller than the inside o your terrarium. Place the separation layer on top of your layer of pebbles, and add a layer of compacted sphagnum moss tightly around the edge of the glass to prevent any soil from dropping through). Step 3: Soak sphagnum moss in water for a few seconds, then squeeze out the excess water and place a thin layer firmly on top of the pebbles or separation layer. Sprinkle the charcoal evenly over the sphagnum moss. Step 4: Add half of the potting mix to the container, creating different height levels. Step 5: Remove the Pot Belly Fig from its pot and gently scrape away any excess soil from the roots. Step 6: Place the plant inside the vase. Gently press the roots down into the soil and add the remaining soil to cover the roots. The tap roots can sit above the soil. Step 7: Add the branch, large rock, black river pebbles, sand and the deer, if using. Place small clumps of moss between the rocks. Step 8: Water the plants thoroughly with a water-spray bottle. Pot belly figs are very hardy; they can tolerate bright indirect sunlight to low-light conditions. Water regularly. If the soil is dry, slowly pour 1/2 cup water into the vase. 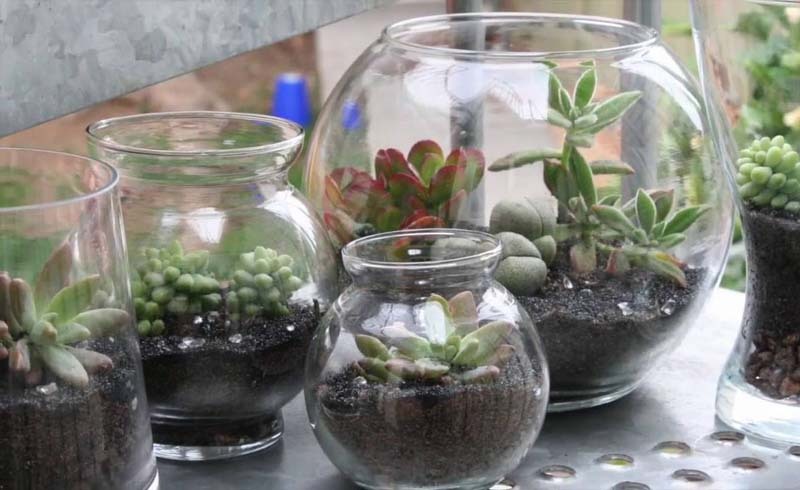 You can use any large vase to make this terrarium. Keep the fig leaves clipped to encourage a bonsai-tree shape. Old kitchen jars are perfect for miniature terrariums! If you have a bunch lying around, this is a great way to use them. Step 1: Give the glass canister a good wash inside and out. Step 2: Pour the small cream pebbles into the bottom of the canister, and gently shake to create an even layer. Add a separation layer, if using (this prevents the soil from dropping down into the drainage layer below. You can use brown paper, a fly screen, or weed matting. Trace around your container and cut out a shape that is 1/2 inch smaller than the inside o your terrarium. Place the separation layer on top of your layer of pebbles, and add a layer of compacted sphagnum moss tightly around the edge of the glass to prevent any soil from dropping through). Step 3: Soak the sphagnum moss in water for a few seconds, then squeeze out the excess water and place a thin layer firmly on top of the pebbles or separation layer. You want to form a barrier so that the soil doesn't drop into the drainage layer below. Step 4: Sprinkle the charcoal evenly over the sphagnum moss. Step 5: Add half of the potting mix to the canister, creating different height levels. Step 6: Remove the plants from their pots and gently scrape away any excess soil from the roots. Step 7: Arrange the plants inside the terrarium. Add the remaining soil to cover the roots and press down firmly. Step 8: Place the rock, pebbles and stones in between the plants and position the live moss around the inside edge of the terrarium. Add the meerkat. Step 9: Water the plants thoroughly with a water-spray bottle. If the container is sealed you may not need additional moisture. Open every few months and slowly pour 1/2 cup water onto the soil, if required. Closed terrariums should fog up. this shows that the eco-system is working effectively. Big droplets indicate there is too much moisture. If this happens, leave the lid open for a few days. Remove the live moss if it starts to brown or turn moldy and replace with fresh moss. Air plants work particularly well in these hanging tea light orbs. They don't require any soil, which can weigh down the terrarium and make it heavy. Step 2: Soak the air plants in a bowl of water for 30 minutes. Step 3: Pour the grey stones into the orb. Step 4: Add the glass pebbles around the front of the orb. Step 5: Drain the air plants and shake off any excess water, as they may rot if they hold extra moisture for too long. Step 6: Arrange your air plants in the orb. Step 7: Add the coral, shells, sea urchin and starfish. Step 8: Attach fishing wire or string to the glass loop at the top of the terrarium, and hang in a sunny spot. Remove the plants and soak in water once a week for 30 minutes. Spritz with a water-spray bottle in warmer months. Air plants do not require soil; they use their roots to anchor themselves to rocks and branches. Curled leaves indicate that the plants are not getting enough water. Desert landscapes really thrive in a round, open container. These terrariums make a cool centerpiece for a dinner or coffee table. Step 2: Pour the small cream pebbles into the bottom of the bowl, and gently shake to create an even layer. Step 3: Sprinkle the charcoal evenly over the pebbles. Step 4: Add three quarters of the potting mix. Step 5: Remove the plants from their pots and gently scrape away any excess soil from the root balls. Step 6: Dig small holes in the soil. Place small plants around the edge and tall plants in the middle. Add the remaining soil to cover the roots and press down firmly. Step 7: Add the large rocks, river pebbles and shiny decorative pebbles around the inside edge of the terrarium and in between the plants. Slowly pour 1 cup water directly onto the soil once a month in winter and every two weeks in summer. Allow the soil to dry out between watering. Cuttings are great to use in these desert gardens. Rotate occasionally if plants start to reach to one side. Give your terrarium a beachy vibe with shells and coral. You can easily get them at your local aquarium store. Step 2: Pour the gravel into the bottom of the vase, but don't go above the concrete base level, so the drainage layer isn't visible. Gently shake to create an even layer. Step 3: Sprinkle the charcoal evenly over the gravel. Step 4: Add three quarters of the potting mix and create a mound in the middle. Step 5: Push the sea fan into the potting mix at the back of the vase. Step 6: Remove the plants from their pots and gently scrape away any excess soil, so you are only left with the root balls. Step 7: Place the taller plants at the back of the vase and the smaller plants towards the front. Add the remaining soil to firmly cover the roots. Step 8: Add the decorative pebbles and the coral rubble around the inside edge of the vase – try to cover all of the soil. Add the shells, sea urchin and starfish. Slowly pour 1/2 cup water directly onto the soil every 7–14 days, depending on the season and climate. Keep the soil moist between watering but not soaking wet. Choose plants with white in their foliage to complement the coral and seashells.Replace any plants that outgrow their environment.